This is super-awesome! Thanks Mike! How can I get the count of a term for a given document and field? You should pull a DocsEnum for that field + term, advance to the docID and call .freq() to get that count. This is also available in term vectors (if you want to get the count for all terms within a single doc). I'm trying to figure out in Lucene 4 the document length (total number of keywords it contains) from the norm vector at query run-time. For some (unclear) reason the encode method of the norm values is not public. Which similarity are you using? Just the default (DefaultSimilarity)? If so, then you can get the docLength from the norm by calling DefaultSimilarity.decodeNormValue. Note that if you boosted the field during indexing it will change this document length (higher boost makes doc length smaller). Also note that this is heavily quantized: we use only a single byte to encode the length by default. If the quantization or mixin of boost is a problem ou can also make your own Similarity impl and store docLen yourself (eg as an int). I'm experimenting with BM25 and the new Language models based similarities in Lucene4. It turns out that the method decodeNormValue() is public for TFIDFSimilarity while protected for the rest. Of course I can expand these similarities classes to publicize this method, so my question is whether there is a special reason why it should not be publicized by default. stores) are private implementation details to it. norm.setInt (and then remove all the encode/decodeNormValue stuff). byte norms. The downside of course is 4X the RAM per field X doc. How can I get the freq of a term in a document? You need to first get a TermsEnum (Terms.iterator(null)), seek to that term (termsEnum.seekExact: verify you got back "true" indicating that the term exists), then use its .advance method to skip to that docID (verify the returned docID is the one you advanced to), then call freq(). How could I get the number of the unique terms in a document in my Similarity impl? That stat is available at indexing time, passed to your Similarity.computeNorm in the FieldInvertState argument, member uniqueTermCount. I'm trying to understand what you explained but I'm pretty confused. I try to create the TermsEnum by the IndexReader but it always giving me null exception. 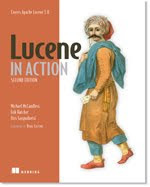 Can you ask this question on the Lucene user's list (java-user@lucene.apache.org)? Hello, I calculate the average term frequency for each document in Similarity.computeNorm and encode it into my norm. However, I need also the corresponding mean value over all documents. Does anybody have a suggestion how I could achieve this? Can you load your norms at search time and sum them up and compute the mean? You'd just have to do it on each searcher init.